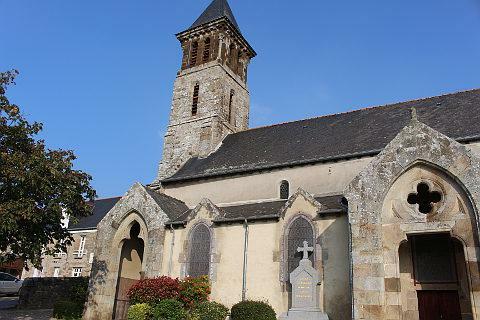 Mont Dol is a pretty village close to the Bay of Mont-Saint-Michel in Brittany. The village sits on the edge of a rocky hill and the cliffs of granite are clearly visible behind some of the houses of the village. Elsewhere trees cover the hillside providing a pretty backdrop to the village. 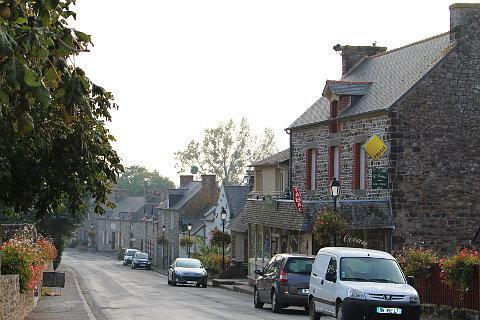 In the centre of Mont Dol there are a church, a couple of hotels and a main street of pretty granite houses with an occasional shop. Take a look inside the church which has some ancient frescoes all around the edges - many of which are still in quite good condition. A series of posters in the church show the detail of the frescoes to make it easier to view the images especially where bits are now missing. 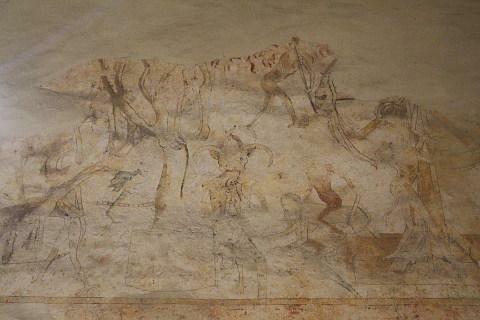 Of course the frescoes include some grisly scenes of the tortures and torments of hell! 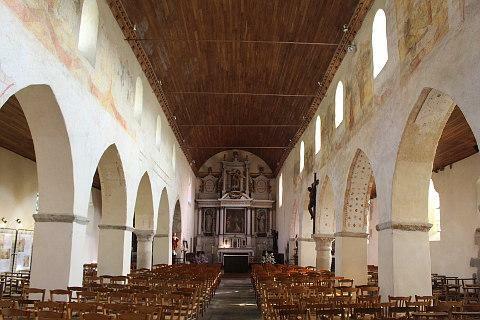 The church also has an attractive wooden roof and whitewashed walls. The granite cliffs around Mont Dol were once the site of quarrying activities, and the houses in this area of Brittany are virtually all made of the local stone. Quarrying here though finished in 1948. 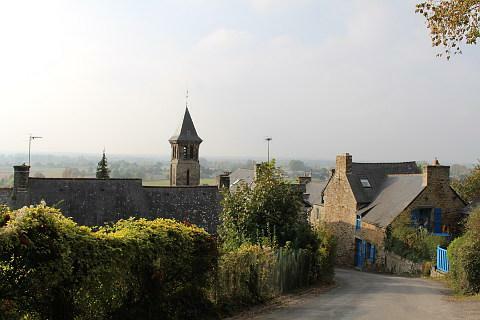 Of course the name Mont Dol belongs to the hill as well as the village! It is only 65 metres high but because everything around is so flat the views are much more extensive than you would expect. Just as extraordinary perhaps when you see how far away the sea is: in prehistoric times Mont Dol was an island surrounded by the sea! From the centre of the village take a walk upwards to the summit of the hill. The walk to the summit is steep but short but you can drive to the top if you prefer. On the way you pass the Chateau de Mont Dol chambre d'hotes. Take a peek over the wall at the lovely gardens below which are a mix of formal gardens and also a large and very well organised and attractive potager (vegetable garden). At the top is a large grassy park area with lots of trees including chestnut trees and plenty of people out collecting chestnuts when we visited in October. 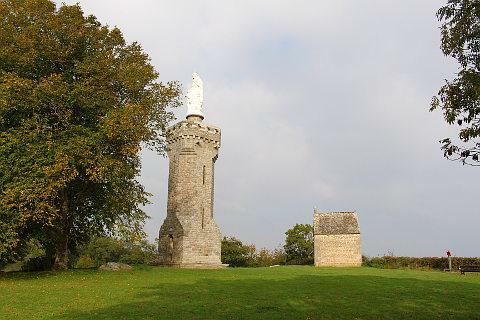 On one side of the hill is a small chapel and the 'Tour Notre Dame' which is topped by a statue of the Virgin Mary. 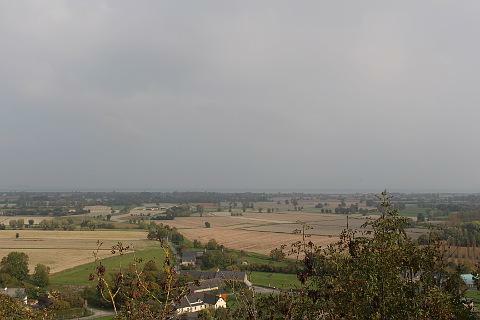 From this spot you can get excellent views over the surrounding countryside and out over the Baie de Mont-Saint-Michel. To get an even better view you can climb to the top of the tower. The chapel is built on the site of an ancient pagan temple thought to date back to Celtic and Roman times. It was later converted into a telegraph post - a 'télégraphe de Chappe'- which was a means of communicating by semaphore. This became obsolete with the invention of the electric telegraph based on the morse code and the building was converted into a small chapel. On the other side of the hill there is a pretty moulin with a small café where you can stop for refreshments and to relax and admire this lovely spot before returning to the village centre of Mont Dol. Of course you will want to visit the nearby town of Dol-de-Bretagne and a visit to Mont-Saint-Michel is a must when you are this close. Mont-Saint-Michel is one of France's top tourist destinations and deservedly so. It really is stunning. On the other side of the Baie de Saint Michel and a similar distance from Mont Dol is the picturesque fishing village of Cancale. You can find more local travel ideas in the Ille-et-Vilaine guide and the Brittany guide.